A Dutch writer of the eighteenth century. He must have died before 1767, since in the edition of the Pentateuch published in that year many of his annotations are quoted with the addition to his name of the Hebrew letters ("of blessed memory!"). The same edition shows that he was a recognized authority on Hebrew grammar, for he is therein frequently styled ("the grammarian"). He was probably a teacher and preacher. The family name Amelander was discovered (by G. Polak) in the epitaph upon the tombstone of Amelander's daughter at the cemetery of Muiderberg. He was a pupil of an Amsterdam dayyan and publisher, Moses Frankfurter, for whose celebrated "Biblica Rabbinica"—(Ḳehillat Mosheh) Amsterdam, 1724-28, he undertook the proof-reading of the Bible text. In 1725 he published, together with his brother-in-law Eliezer Rudelsheim, a Judæo-German Bible Commentary with text, under the title "Maggishe MinḦah" (they who bring an offering), in folio, a work which enjoyed considerable reputation, and, in view of its period, is not altogether without merit. His edition of "Midrash TanḦuma," published in 1733, contained marginal notes giving short verbal and technical explanations. The Pentateuch edition mentioned above (with the commentaries "Ḥinnuk" and "Debeḳ Ṭob") contains also a few extended annotations by him. In De Vidas' "Reshit Ḥokmah" (The Beginning of Wisdom), published in Amsterdam in 1776, the commentary entitled "La-Da'at Ḥokmah" (To Understand Wisdom), is by Amelander. His best-known work, however, is the Judæo-German continuation of "Josippon," which first appeared in Amsterdam in 1744. It contains, in addition to many legends, a compendium of Jewish history down to his time, but is especially valuable for information concerning the settlement and history of the Jews in Holland, particularly in Amsterdam. Indeed, for the history of the German and Polish Jews there, it is almost the only source of information. Proof of the great interest aroused by the book is to be found in the fact that as early as 1767 it was reprinted in Fürth. The edition that appeared in Amsterdam in 1771, entitled "Keter Malkut" or "Sheerit Yisrael," contained an additional chapter continuing the history of the Jews up to the year 1770. This chapter, however, does not appear to have been written by Amelander, but by the publisher of the work. 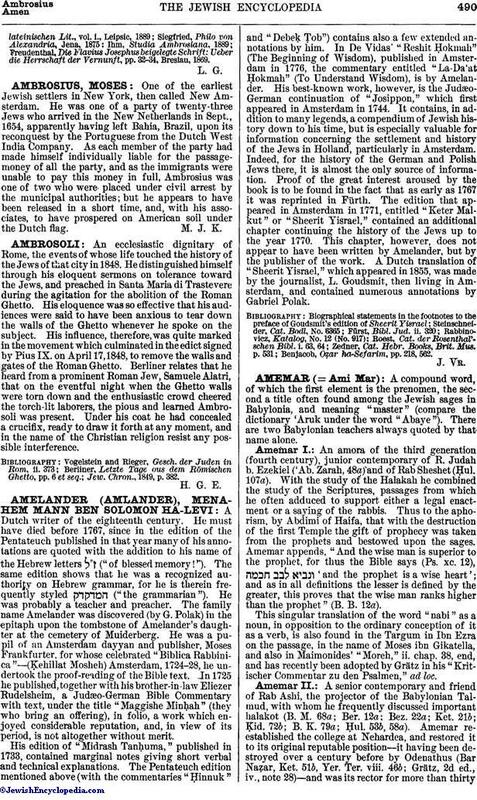 A Dutch translation of "Sheerit Yisrael," which appeared in 1855, was made by the journalist, L. Goudsmit, then living in Amsterdam, and contained numerous annotations by Gabriel Polak. Benjacob, Oẓar ha-Sefarim, pp. 218, 562.